By stayhomecupcake on April 12th, 2012 . Filed under: Crafts, Cupcake Ideas, Jewelry, Kids . It is no secret that I love Etsy! I have been buying and selling on there for quite a few years and it has turned into a wonderful marketplace to find unique handmade crafts as well as antiques. 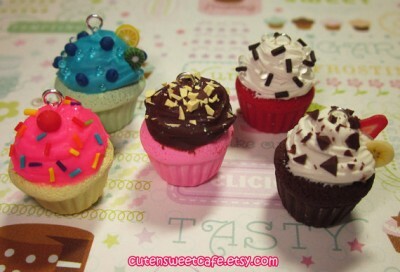 Check out these amazing polymer clay cupcakes made by Etsy crafter and ATC sponsor, CuteNSweetCafe. For only $13 you can design your own cupcake charm and add a scent too! Yes, this charm can smell like a cupcake or one of over 50 other scents. You can also choose your base color, icing flavor and toppings. You can truly make this cupcake your own!